After reading a recent post stored in Jim’s Auxiliary Memory, I decided to look into LibraryThing. I’ve spent quite a bit of time entering many of the books I have – all the GP ones and a few others I have besides. As Jim points out in his post, it’s quite interesting to see how many other people on the site have the same books as you. Some of these people have staggeringly large libraries – thousands of books. I don’t aspire to have that many titles, but there are certain books that I want to get eventually. It begs the question (for me at least): what good is having all these books?? To my way of thinking, unless a title is a first (or otherwise important) edition, where’s the significance in having it?? Anything other than a first edition is for all intents and purposes worthless. So, you have a few hundred paperbacks, so what?? Buy the thing to read it, sure, but after that, where’s the significance in owning it?? Why take up valuable space?? In my opinion, a four-book library consisting of first editions of, for example, I, Robot, Titus Groan, Stranger in a Strange Land and Dune is a hell of a lot more impressive than a couple of thousand paperbacks. Indeed, it’s immeasurably more impressive than all the first editions I have at the moment – and that includes a couple of other Heinlein firsts. Perhaps I’m being a little harsh, after all, we often form a kind of attachment to these things for various reasons or a combination of reasons. 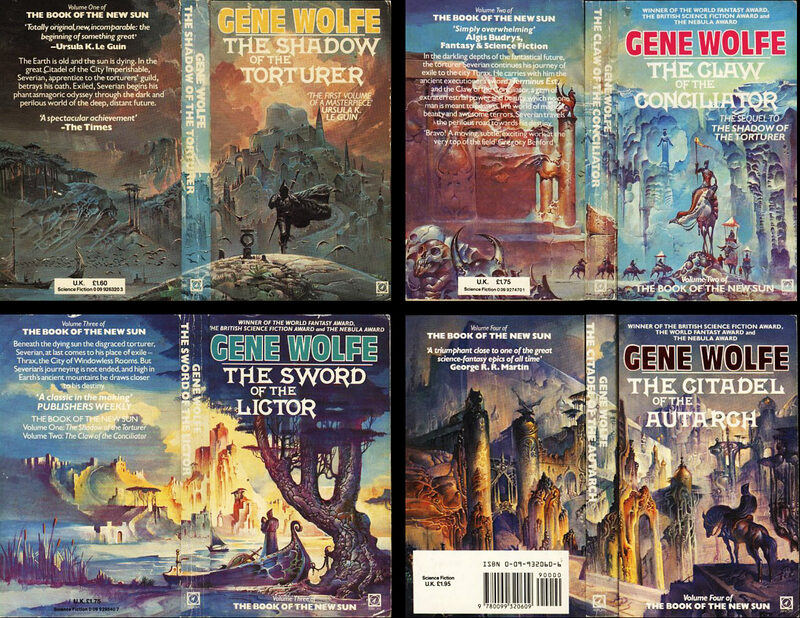 As a personal example, I would like to someday have back the Arrow paperback editions of Gene Wolfe‘s The Book of the New Sun because not only is he my favorite author and that is my favorite series of books, but because at age about 13 or 14 those particular editions were my introduction to Gene Wolfe’s work and Bruce Pennington‘s accompanying cover art is second to none in delivering the feel and atmosphere of that particular story. I found what looks like a reproduction of the original cover art of Shadow of the Torturer here amongst some of his other cover art. Actually, I have had at various times many paperback editions graced by Pennington’s art: the Dune series, quite a few Brian Aldiss titles, Clark Ashton Smith collections and several other works by Wolfe. Anyway, I seem to have strayed a bit from LibraryThing, so back to that. I’ve only entered the hardback first editions I have. I haven’t bothered to note the few paperbacks of mine I have left, with reference to what I mentioned earlier, I don’t see the point – they’re not worth parading as part of my book collection. I’m considering putting them under the ‘Read But Unowned’ category. To complete that list, what an exercise in recall that will be. This entry was posted on April 24, 2010 at 1:20 am and is filed under Gene Wolfe, Uncategorized with tags Bruce Pennington, Gene Wolfe, LibraryThing. You can follow any responses to this entry through the RSS 2.0 feed. You can leave a response, or trackback from your own site.